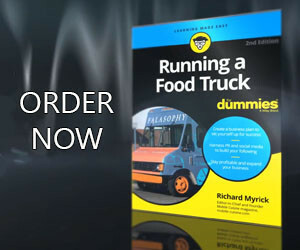 Increasing sales and profits are the top goal of most food truck owners I speak with. To do this, it requires that the vendor focus their effort. All too often, food truck owners look for a quick fix to increase customer traffic, turn to creative advertising campaigns, hoping they will provide the “cure-all” needed to bolster sales. There is much more to marketing than just advertising, however. In fact, nearly 80 percent of all marketing takes place outside of your food truck. Today we’ll discuss a four walls marketing approach. Four walls marketing is a practice used by restaurant owners, and although your customers do not sit down inside your truck, the same type of marketing strategy can be used by food truck owners. The idea behind four walls marketing involves the physical appearance of the business, the attitude and appearance of your employees, and the type of experience you create for your customers. Unfortunately, many mobile food business owners spend time on social media advertising campaigns to bring customers up to their service window only to have them disappointed by their experience. Truck Appearance. Does the appearance my truck provide an environment that I would feel comfortable in as a customer? Is my truck clean? Is the sidewalk or parking area clean? An clean environment around your truck can become the place of outstanding customer experiences. Menu. Are my menu items made with the highest quality and consistency? Believe enough in your food products to inspire others to believe in them too. Because your reputation is at stake, you should tolerate nothing less than perfection. Staff. Does my staff project a positive, enthusiastic, customer-minded attitude? This is the most critical element. The people who staff your business determine the ultimate success of your mobile food business. Instill in your staff that building relationships with customers is the business of doing business. If you were not able to answer yes to all three of these questions, you need to make the necessary adjustments to your food truck and staff so you can. If you answered yes to all three questions, congratulations. Now, take an additional step and ask the real decision-makers; your customers. Customers tend to see things from a different perspective than you do. If your customers’ answers match your own, you’re on the right track. Because everything relates to the customers’ experience, don’t just settle for customer satisfaction. The best strategy you can adopt to lead your food truck business to success is to strive to exceed your customers’ expectations. Once you’re using an effective four walls marketing plan as your primary effort in marketing your food truck, you can supplement it with other strategies. Suggestive selling: With some simple training and follow-up, your staff can increase sales without adding a single new customer. Find an item or service that can be offered to customers to complement what they already are purchasing. Don’t be discouraged by rejection. If you are successful in suggestive selling only one of 10 customers, it can have a tremendous impact on your truck’s annual sales. Upsizing/upselling: If you offer more than one size for your menu items, suggest the bigger size, then let the customer decide. Most people want the bigger size; they are just waiting for someone to persuade them. Again, you will increase sales without adding a single new customer. By using an effective four walls marketing plan and supplementing it with advertising and other creative strategies, you’ll be well on your way to achieving your food truck goal for increased sales.